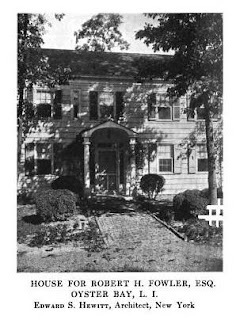 The Robert Henry Fowler residence designed by Edward S. Hewitt in Oyster Bay. Fowler was a surgeon and author of Modern Tonsil Surgery, 1930. He was also a founder and president of the New York Tonsil Hospital. It is unknown if the house is extant. Photo from the Annual Exhibition of the Architectural League of New York, 1921. Houses like this, though nice, I don't consider estates. I have homes like this in my town. Charming, and historic, but not gilded age mansions.